Travelling Europe on a less than meagre budget is not much fun. Or is it? We hit Venice after a horrendous night under leaky canvas, during which most of Italy’s annual rainfall chose to descend on our mainland campsite, swooshing away some tents, leaving their occupants open to the elements and seriously discomfited. I spent the night shivering on an army issue camp stretcher from WW1, gingerly dipping my finger into the rapidly rising flood below, and wondering when it would be my turn to float off. On a back canal I find a workshop where father and son are handcarving the prow for a recently completed gondola which stands, glossy black, on a workhorse nearby. I watch them, fascinated, for some time, and move on. The street is still, very quiet. My next discovery is a small family owned glass-blowing works, also on a canal, a pea-green one. 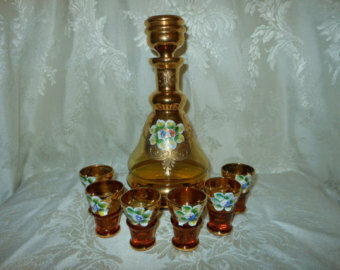 They’re busy creating an amber coloured wine decanter, smallish with an ornate stopper, and six tiny glasses. The whole set is then gilded in the traditional Venetian manner, and hand painted with chunky little white flowers. It stands on our mantlepiece today, full of memories. Walking equals appetite in my book. A workmen’s trattoria is at hand; a huge bowl of pasta, loaded with tomatoes and cheese and other goodies appears and I bend to it with fork and spoon, just as everyone else is doing and never mind good manners, it is superb! Strolling back to the group, I take the same route past the glass blowers to collect my purchase and they insist on taking me home for ‘lunch’ – 16.00hrs. A steep and musty stairway leads to their apartment overlooking… another canal. The space is full of sunlight and fragrant with the rich scents of traditional Italian cooking. 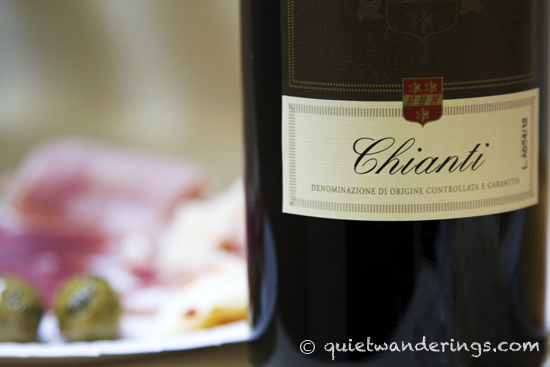 We sit around an old, much scrubbed table – Signor opens a bottle of chianti and welcomes me, in voluble Italian, to his extended and noisy family. I manage a wobbly Grazie Signor, molto molto grazie , and drink deeply. A massive bowl of spaghetti bolognaise, with every imaginable ingredient bursting forth is passed round, followed by a green leaf and tomato salad, thoroughly drenched in olive oil and garlic. Followed by more chianti and chatter. What a wonderful family, what an experience. What a full tummy. Back to St Mark’s and the grumpy group. They’ve mooched around the obvious tourist traps, unable to afford to pay the rip-off prices, and haven’t enjoyed the day at all. 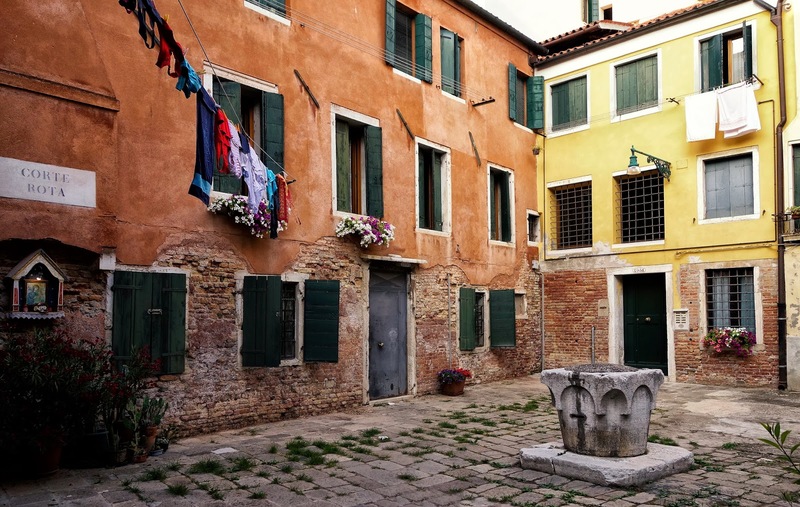 This entry was posted in Jacqueline Dowling and tagged chianti, glass blowing, travel on a budget, Venice. Aah, Venice! You describe it so beautifully, Jacky. The little paths, alleys and bridges over hidden canals are so wonderful to discover. It was in Venice that I discovered a wood-artist’s studio, way off the beaten track, which later formed the core setting for one of my novels. Well there you go! I’d love to read the novel Susan – who knows, it might be the same wood-artist who was turning the gondola prows. Venice really does need to be explored away from St Marks doesn’t it? there’s just so much to see, smell and absorb. Thanks for your comment. I should add that the home-bound vaporetto didn’t sink under my ballast of bolognaise! I read that novel and you described Venice beautifully. Oh, the rest of the novel was great too … Benicios Bequest … search for it on Amazon! A wonderful piece, again, Jacky. I love Venice and I loved the backstreets too. Thanks for rekindling those memories. And it’s settled, I’m having pasta for supper! Oh and I’m going to visit Venice in a couple of weeks (the one in Vegas). Sorry that’s a terribly funny comparison! Haha – I know where you’re going, all those canals and fireworks and fruit machines, very tempting. Watch out for the exploding sinking pirate ship, it’s not a gondola!